Correlation is not causation | Another dot in the blogosphere? I am not surprised not because I agree with the statement but because I have come to expect the Straits Times to publish such misleading information as truth. I have said it before and I will say it again: Correlation is not causation. There are so many things that can cause unhappiness. Taking a poll and reacting to poorly drawn conclusions can cause unhappiness. You can sample a segment of a population and collect data on, say, the brand of toilet paper they prefer, and the incidence of crimes like peeping toms. The data might reveal a strong correlation between those who like Itchy Bum brand and the likelihood of being watched by a peeping tom. But you cannot conclude that one causes the other. You can only say there is some relationship between the two variables. I have a second problem with the way the data was presented. The article states that respondents who rated themselves “happy” spent 5.4 hours online each day. Those who rated themselves “unhappy” spent 5.8 hours online. Ignoring how happiness or unhappiness was determined, is 0.4 hours (24 minutes) statistically significant? Is is pragmatically significant? Just because there is a numerical difference does not make it significant. Worse still, a layperson who reacts extremely to this might take the results as prescriptive. They might take the article as advice on what to do instead of analyzing it more critically. 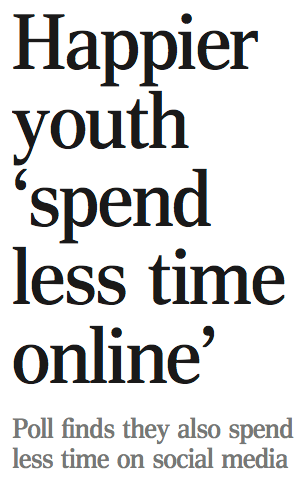 Might a parent or teacher then insist on 5.4 hour cap of online activity? This is not as ridiculous as it sounds when you consider how people react to articles about whether to drink wine or eat a particular type of fish for health reasons. These folks switch diets, brands, and behaviours at the drop of a hat. And at the drop of a physical newspaper at their doorstep. This newspaper is the same one that would prefer to bash a competitive medium (online bad, paper good) instead of reinvent itself to fully take advantage of positive change. The same newspaper that had an opportunity in this case to educate but chose to misinform instead. Present the same information in an online forum or Facebook and watch what happens. The misinformation gets discussed and eventually might get corrected. 2 Responses to "Correlation is not causation"
Anything to sell the paper. Although it would also make a great teaching tool regarding not believing everything you read. John Howard, a former Australian prime minister, won an election based on a lie about refugees throwing their children overboard. The story was all over the media, not until years later did the truth come out that the refugees were passing their children to be rescued from a sinking boat, and the PM knew the truth at the time, but he needed to win an election. I use that story often in class. Great point about using those articles to teach critical thinking or to highlight hidden agendas!